A new Kelley Armstrong interview has been posted over at Love Romances & More Reviews with a wide-ranging discussion of her books. Check it out. 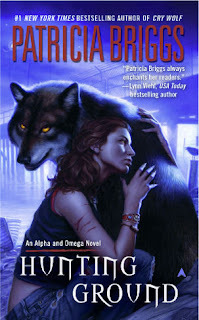 Jackie at Literary Escapism found the new US cover art for Patricia Briggs’ Hunting Ground, the next Alpha and Omega novel posted over at Tez Says who in turn found it on Facebook. To be released July 28, 2009. The Science Fiction Writers of America (SFWA) announced the draft Preliminary Ballot for the Nebula Awards for 2008. The final ballot will be mailed in early March and the Nebula Awards Weekend will be held April 24-26 at the Luxe Hotel Sunset Boulevard, with the awards presentation banquet to be held on the UCLA campus to tie in with the Los Angeles Times Festival of Books. 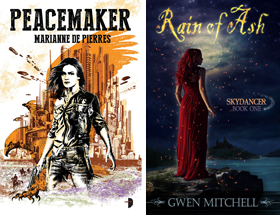 Check out the official SFWA website for the complete list. My pleasure Tez, you too ! I can't wait to read the Patricia Briggs novel Alpha & Omega and Bone crossed...thx for the Cover sneak peak.. I'm almost done reading Unclean Spirits. Once I'm done I'm going share my thoughts with you in respects to the book. Hi Tanya Briggs is always on my "can't wait" list. Looking forward to your thoughts on Unclean Spirits. I am shortly going to be reviewing another UF written by a guy (a recent trend perhaps) called Blood Blade. I finished reading Unclean Spirits! The book itself was a quick read, there were moments that I struggled with Jayne's constant complaining woe is me attitude. However, she comes from a somewhat sheltered environment and is still coming onto her own. Which explains the constant doubt & insecurity. Reality stands she is thrust into a very unreal setting and trying to cope. So even though it grated with the constant complaining, the author depicted it in a real way. The book left me with many questions, which I'm assuming the following books will answer. How did she get the tattoos and what is the significance? Did Eric leave something written explaining why he chose her? To me even though the book explains that Eric would not really explain things etc. It also describes Eric's character as having foresight to plan ahead, so if this is the case why wouldn't he leave Jayne a note, a video, something this bothers me.. The subject the author chose is different and when you google "Unclean Spirits" there are plenty of articles on the subject. Which I found to be very fascinating and leaves room for a lot of possibilities for the series. I have @ least 19 books on my TBR pile and I'm forcing myself to read the older ones. I'm currently reading Heart Of Stone by C.E. Murphy..
Tanya that's a great mini-review and I share many of the same questions. I did find the story engaging enough to definitely want to read the next book. First books have so many challenges in establishing characters and worlds it is surprising that they do as well as they do. Never thought to research the term 'unclean spirits'. I imagine Abraham did his research. As for Heart of Stone, that is a great choice. I am a big fan of Murphy's. My challenge is not going out and buying the second part to the negotiator series. I need to at least get half way through my TBR pile. I'm a big fan of C.E. Murphy's work and I can't wait for the next Joanne Walker book. It seems like it's taking forever..
LOL. I would love to have the time to setup a Library thing or similar account but the task is way too daunting. And of course on the right sidebar I have links to all the books I have read in 2006-2008. I figured you probably didn't have one set up. (lol) Given all the books you read and review but I figured it wouldn't hurt to ask..
Oh my....I knew it would be a lot..But seeing it..whew! I can see why the notion of creating a virtual library would be daunting & funny!